Best show of the two in the US by far. Respectable was absolute unbelievable, best version I have heard, and John Mayer lifted the level seriously. Guitars Guitars Guitars! The band was good all through the show, powerful, fresh, smiling, communication and musically powerful. Mick Taylor cool and great on Rambler. The rest was like a home run. It just got better and better. I was up front and planned to move around and see the show from different places, but I was nailed to my spot through the show. Thank you Stones for cranking up the level several steps! The show on Saturday will be THE show, they are on to something great now! What a great night, what a fantastic show! I must say that the waiting lines were a mess� the pit tongue entrance was in a side street, next to the VIP packages� we waited, waited and a New Jersey girl, who came around 2 o�clock was complaining that nobody knew what to do next. Even the security guys didn�t received a good briefing and once inside you received your wristband and you had to find out yourself to enter the pit, unbelievable. But enough, over to the show, first of all was it again very nice to speak to so many familiar faces and Stones friends from all over the world. 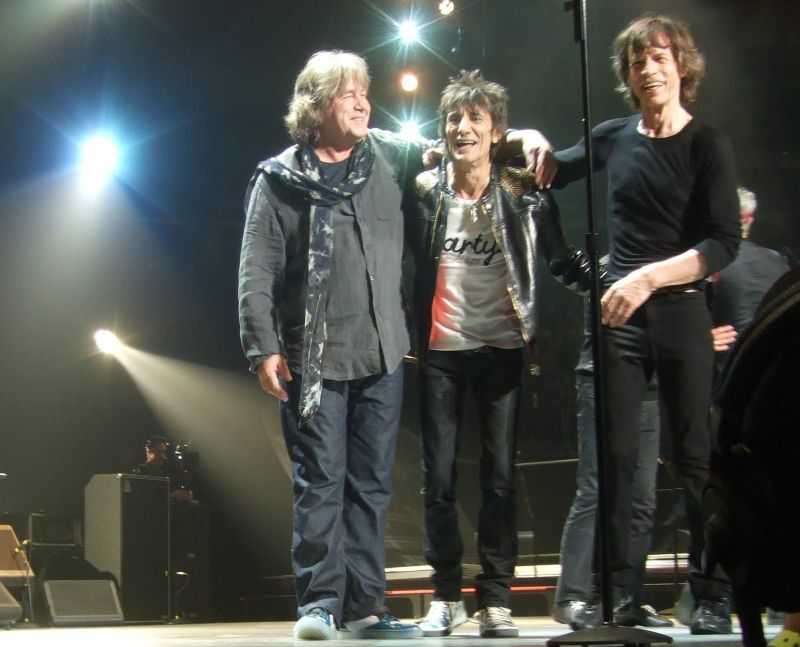 And the show was gas gas gas� the Stones had a lot of energy, Lisa did an amazing version of Gimme Shelter and Mick Taylor starts to find his way back to the Stones, you could see that he enjoyed it, so did all other band members. I didn�t knew John Mayer but oh my ***, Respectable really rocked! Wild Horses was a highlight until they started with the first tunes of Around And Around, way back to the sixties. The Stones had fun, so had the audience and I really liked the One More Shot version tonight. Keith forgot to sing the lines Love, Love, Love and you could only hear Lisa and Bernard in the background. 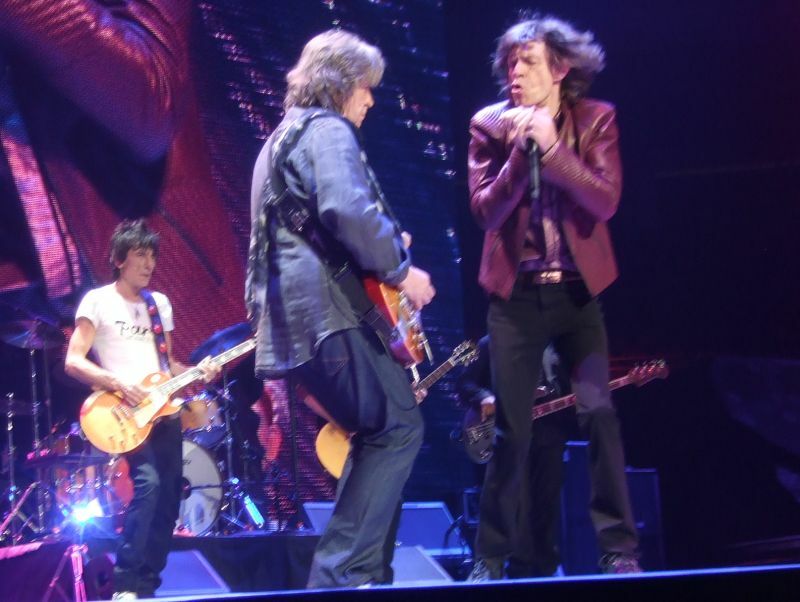 Mick had several times eye contact with Keith to let him know where to fill in. Up to the One More Shot TV pay by view show on Saturday, I won�t follow it in front of my TV, but it real time and tonight was the general repetition with much more camera�s in front of fans. All photos by Peter Lcres. It was one of the harder tickets I have ever had to track down for a Stones show, but it was well worth the nervous wait. It was my 20th show since '81 and I'm so glad I didn't have to retire at 19 (20 is such a better number). 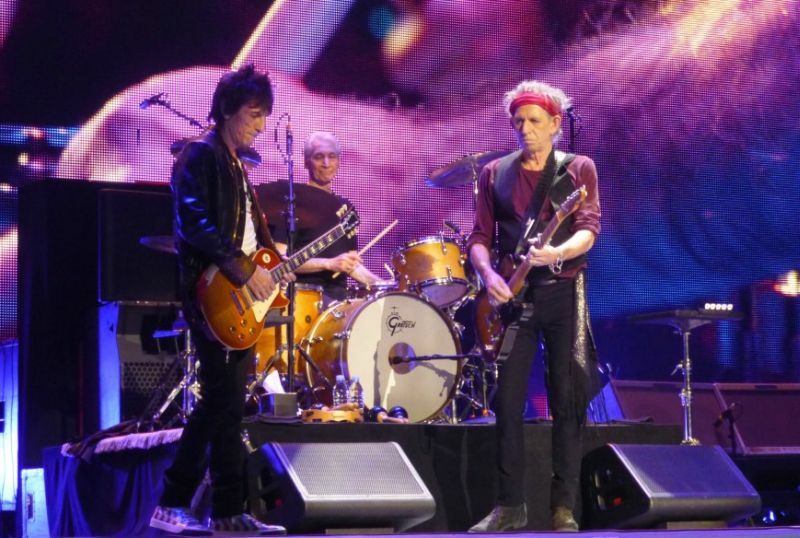 In recent years there have been many naysayers on this board about the quality of the Stones playing, but I have to say they sounded great last night. 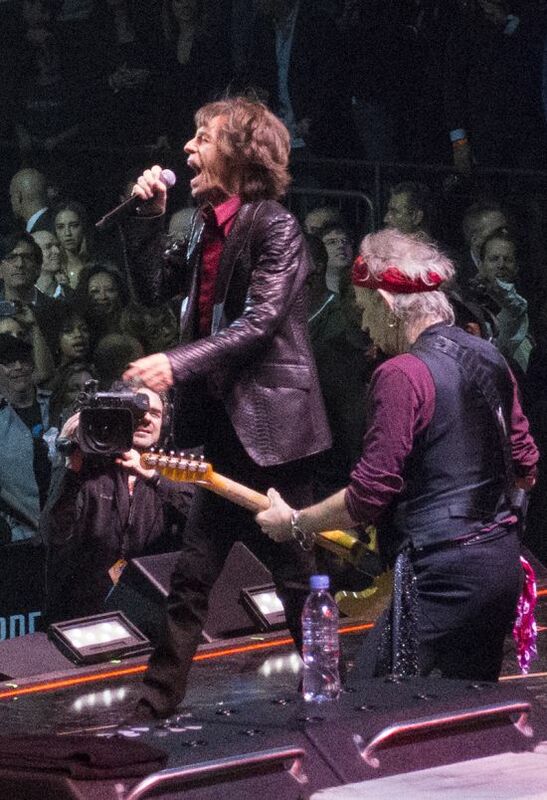 I am not a musician myself, so when i go to a Stones show, I want them to sound like the Rolling Stones and last night they met that criteria, easily! No need to go song by song as I am sure others will do that for us, so I'll just add my thoughts on a few choice moments. First off, every tour I try and stay away from reports of earlier shows until i go myself, so I can be surprised by the surprises, but this year since I wasn't sure I'd be going I had read all about the London shows, but about Brooklyn, I knew nothing. So when i heard reports of the many guests lined up for Saturday, I was a little bummed out thinking they'd all show up on Thursday for a warm-up. Thankfully, I was wrong. I go to a Stones show to see the Stones, not Bruce Springsteen and certainly not Lady Gaga (seeing her would have made me feel like I had gotten GOOD guests at my Beacon show!). On Thursday, we only got one guest--John Mayer--and he fit in perfectly on Respectable. As he traded solos with Ronnie and Keith, all three looked like they were having a ball. We got an extended version of the song, as John took a turn at the lead, followed by Ronnie, on to Keith and back to John Mayer. 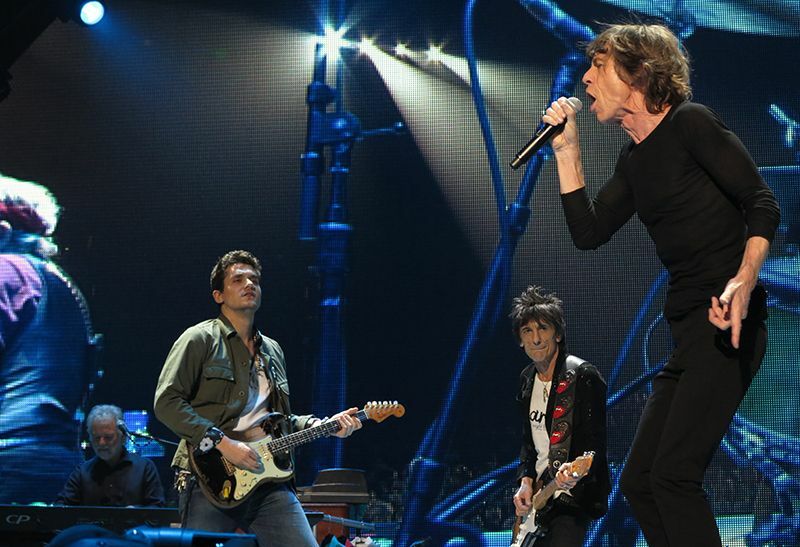 The Stones are not usually a guitar solo band, but in this instance it worked great. 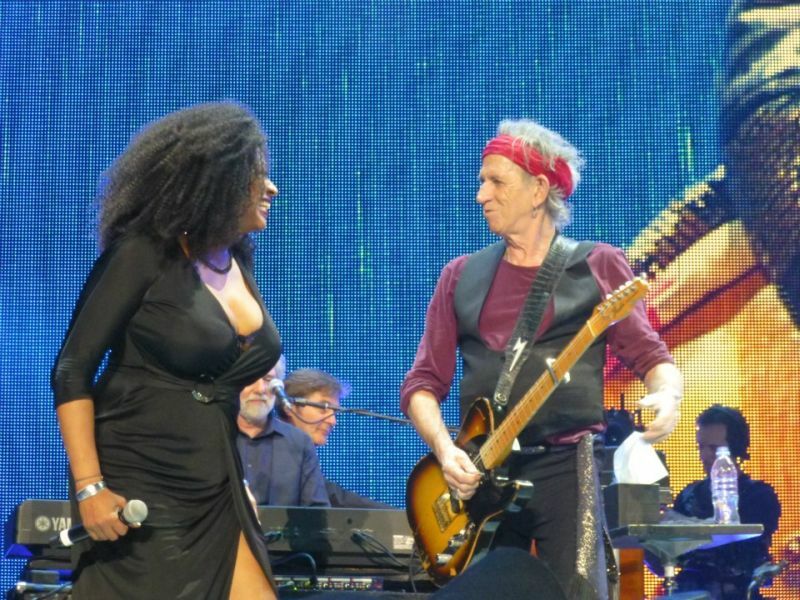 As for Gimme Shelter, Lisa got her old job back and showed why we don't need Mary J. Blige, Lady Gaga or anyone else showing up at these gigs. I was glad she was allowed to sing her part once on this tour. Tonight, in the role of Bill Wyman... Keith Richards. Bill was apparently unable to complete his swim across the Atlantic in time for these shows, but for much of the show Keith channeled his inner Bill in that he didn't move around at all. He reminded me of Bill in '89 when he said he finally graduated to taking short walks before returning to his normal spot on the stage. Keith hung out in front of Charlie for most of the night, but apparently he was just saving his energy for the last six songs. 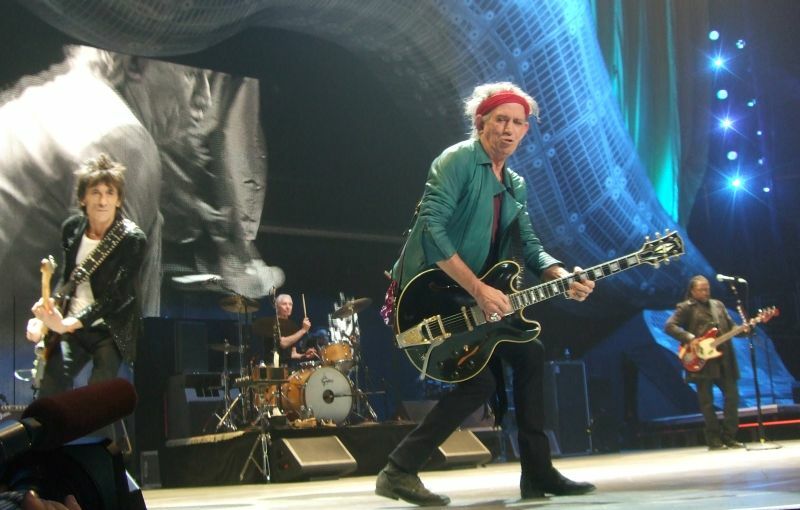 Beginning with Tumbling Dice, Keith began to use the whole stage and even ventured around the pit a couple of times. He may not play as much guitar as he used to, but what he did sounded great to me and it seemed like during Sympathy for the Devil, the techs turned his amp up, because he was markedly louder for the last few songs of the show. Keith's turn at the mike was safe, as he did the same two he's done for the whole "tour." I was hoping we'd get Run Rudolph Run, but knew that was a looong shot. Keith did not give us the same old "It's good to be here..." joke when he spoke, instead he said "Hey are you doing Newark?" Followed by Before they Make Me Run." Ronnie was in good spirits all night (isn't he always?). He sounded great and made good use of the tongue pit/stage as he took three or four laps around it at various points during the show. He also seemed to have a ball playing his lap steel on Happy, as he was literally bouncing in his seat by the end of the song. We also got a web choice (practice for the PPV show, I guess). Of all the songs on the list, I had hoped Rocks Off would win, but the version of Around and Around we got was great. Mick joked they hadn't played it in ages, so he asked the band if anyone knew it and then said, "Ronnie says he does" and away they went, accompanied by a video tribute in the background to all of their rock and roll heroes, that culminated in a clip of Chuck Berry (was this really a legitimate vote?). Paint it Black sounded good, but if they had asked me (and that was less likely to happen than hearing Run Rudolph Run), I would have led into that song with a video of Brian on the sitar. I saw the Beach Boys last summer and they worked in great videos of Carl and Dennis Wilson while the band played along with them and though I haven't watched it yet, I hear the Who did the something similar with Keith Moon at 121212. In a 50th anniversary show, that would have been perfect. Mick Taylor was there for Midnight Rambler and it was cool to see him playing with the boys once again. Two great moments during this song: while Mick was hopping around the front of the stage in full spasm mode, the three guitarists huddled in front of Charlie jamming and seeming to almost laugh as if they were thinking we'll just hang out here and play until he's done with whatever he's doing out there; and then later Mick joined them in front of the drums and despite the massive stage, the old band (almost), plus Ronnie was back together within a five foot circle. I hope someone in the pit was quick enough to get that picture and share it with the board. I could go on and on but will leave space for other reviewers to do that, though I will add that I am glad they kept the news songs in the set. I hadn't listened to them too much, but thought they sounded better live than in studio. I am guessing if they tour in 2013, one or both will be dropped, so I am glad I got to hear them one time. I have to disagree with the first review concerning John Mayer. He looked like a deer in headlights and probably could not believe he was actually playing with the RS. MT was very good, though I think better back in London. Keith wasn't moving much with the exception of Satisfaction where he made a trip around the circle (mouth). Ronnie made the same trip for Miss You. They seemed to get lost in the song a bit in "One More Shot" The first few songs seemed to be a bit of an effort rhythmically for the band. The highlight for me was "Around and Around" - great to hear that live, though Still Life is much better. Keith looked a bit off for Around and Around, trying to find himself a bit. well the long wait finally over for me and 20,000 other fans last night,the rolling stones were in newark nj for part 4 of there 5 concert trilogy to support there 50 and counting mini tour.before i get to the show review,i would like to make some comments about what really amazed me,before i even entered the building.unlike the general opinion from many who posted on this website the previous month or so(and what was my opinion as well)this was not a crowd made up mostly of corporate america's working class,the ones who were comped tickets(though of course that happened)or people who weren't real fans,just ones that could afford the outragous prices.also i was amazed at how many young people between the ages of 18-25 were theere on there own,with no parents that came to bring them to see what all the fuss has been about since 1964.many,the ones i spoke to were there with there own tickets they had bought,with money they saved on there own.i must admit,being the die hard fan i have been for 35 years,this really touched me. now on to the show,the lights went out at 8:50,on the large giant screens there was a video playing with many artists and fans alike,describing what the band means to them and any thoughts they may have. my 2 favorite comments from artists were,elton john saying when he first heard the band,he said to himself,what the hell is this.and iggy pop saying when he first heard keiths guitar sound,it was like getting hit across the face with a dead mackerel. soon after the sides of the stage came alive with a thunderous marching drum ensemble. it lasted around five minutes,and really helped to intensify this already festive crowd.then lights out,and the stones are on stage cranking out get off of my cloud,jaggers voice ids loud and clear from my section 228 seat,but the mix was not quite right to start things off.otherwise a nice opening,but not one i would of opened with,had the choice been mine.by the time the last time,had followed,the sound was point on,that song rocked and you could feel the band loosen up and kick it up a few notches. next was its only rock and roll,mick missed his cue,but keith extended intro helped the band recover nicely and we were treated to a great version of this sing along timeless rocker,mick starts working his way around the circle pit getting everyone reved up and the rolling stones core four have the engines running full blast.keiths focused,no cigarettes no distractions,ronnie sober,animated,and playing with renewed vigor. 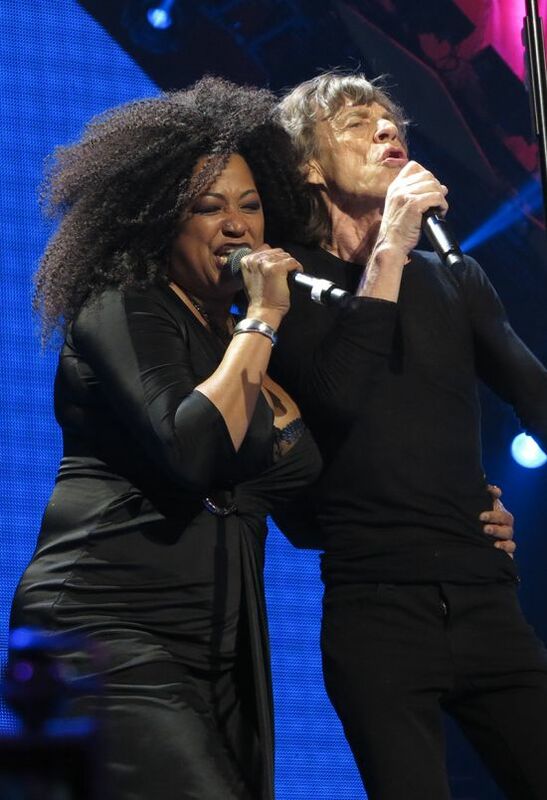 it was great to have lisa back on gimme shelter,just awesome. john mayer guested,and the evenings biggest surprise for me,was that they eliminated the blues number i thought he would play on,and we were treated to a blistering respectable.mayer,whoi am,or atleast to this point have not been a fan of ,just tears this one up.his playing pushed ronnie and keith into some great soloing of there own,a remarkable take,and a true 1st half highlite. the 2 new songs doom and gloom and one more shot fit in very well,gloom and doom rocked really hard.one really nice treat was round and round,one which mick says they haven't played in forever,but seemed like they had been rehearing it for ever,stellar guitar work here,ronnie and keith are so locked in by know im watching in awe. after the into's mick stepped aside and keith delivered his 2 songs.unlike tours past,no ballads tonight,keith does two rockers before they make me run and happy.the new keith hear ids focused and these are not bathroom breaks they hold up to the rest of the show.ronnie gives us some incredible slide on the latter,and the unflappable charlie and darryl are keeping the timing ,as well as any in the business. charlie is remarkable tonite,seems like he could of played 4 hours.next highlite as the 2nd half starts,mick taylor did make it to newark for a smoking hot version of midnight rambler.so great for the stones to bring the best guitarist the bands ever had back for these remarkable shows.he did not dissapoint, we are treated to an unbelievable jam here,micks soloing and micks harp trading off .taylors guitar soloing is fast and angry,but he's under control,jagger goes into overdrive at the 4 minute mark,he's dancing like a madman(is he really 70)and the crowd is roaring its approval. the last 60 minutes of last nights show was remarkable,better than any given band on any given night,i think few in attendance would disagree.tumbling dice had mick working the crowd from every possible point on the circular stage,flawless is the playing.the striped down brown sugar is raw,nasty,and keith nails the into.boby keys who came along for the party rocked his solo,him a nd sideman chuck leavell(keyboards)were brilliant all night. sympathy for the devil closed out the set,jaggers vocal loud and haunting,keiths soloing spot on,best since bridges to babylon tour.keith and ronnie cirle the stage,its keith time now,he doesn't play the roll of guitar god,he is the guitar god. encores include a lovely,you cant always get what you want,and blistering jumping jackflash abd satisfaction.tonights show was truley a remarkable event,im so happy not only for myself,but for everyone else who attended.unlike so many other bands,you never have to say,i wished i could of seen them in there prime,the rolling stones prime is here as i write this review. Above photos by Michel N. Werthenschlag. Making the trip up from Philly I experienced my first visit to Newark and my first to the Pru center and of course it is to the see the World's Greatest Rock n Roll Band ..... the Rolling Stones. Sitting next to the stage on Ronnie's side I could see the gorilla drummers lining up and I knew we were now moments away. The boys gathered behind the drum kit waiting for the intro to end. Bang....Hey Hey You You Get Off Of My Cloud. Nice to hear this tune sung and played with such energy. Off to a good start. I really enjoy hearing this one when they play it. The energy continued through out the show with Mick egging on the crowd as usual , Ronnie and Keith keeping it tight and Charlie and Daryl keeping the groove. Respectable - I have not heard this awesome tune in a while and it was a treat. The guitars were spectacular. 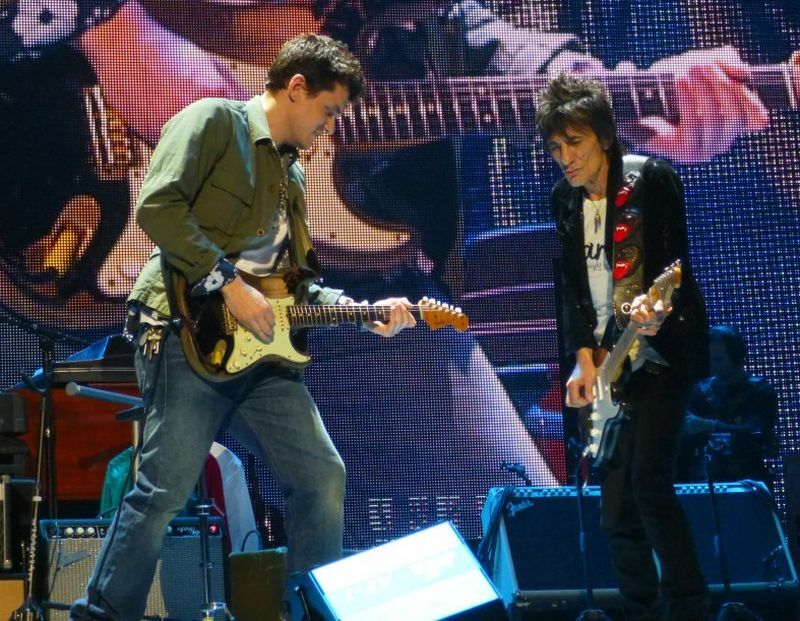 John Mayer as a guest, Keith and Ronnie all played some mean strings on that one. Whew! Around and Around - not sure if I have ever heard this one live. It sounded great. I was up and dancin'. Doom and Gloom - I particularly like the guitar licks on this one. Midnight Rambler - Mick on harp ....yeah baby. MT sounding loose and relaxed. YCAGWYW - I like the choir . It adds a nice touch. Oh....my most thrilling highlight and I am sure everyone else's too.....seeing yours truly on the big screen in the fan vid. Who Hooooooo! Looking forward to Saturday Night. Especially for Lady goo go. I hope they mix up the set list a bit. During last night's show, Mick and I had a moment. He had just announced that "Around and Around" would be the fan request number. I was thrilled. This was one of the songs that first made me fall in love with the band all those years ago. He went on to say "We haven't done this one in a long time. Anyone remember this song?" Expecting a full throated audience endorsement, I leant my voice to the proceedings and yelled "Yeah!"... to a relatively quiet arena. That prompted Mick to quip "Great. One person." This was a show about moments. While Saturday's show at the Barclays Center was steady and consistently clean (And maybe a bit safe), this show was more about wild outbursts. Mick Taylor's searing solo work on "Midnight Rambler" was a perfect example. At times he seemed to spin off into his own world. So was Keith's guitar on "Sympathy." His attitude was diffident. He was asserting his dominance in a way that dared you not to take notice. I thought at one point he might actually drown out Mick's vocal. There was nothing safe or cautious about last night's performance. The band played like they were on the ledge of a burning building. It was more typical of their best live performances, ragged around the edges, intense, and always in danger of spinning completely out of control. And not to be overly technical, but there were many moments where that's exactly what seemed to be happening. The first time I noticed things going out of sync was during "Miss You." The melody seemed to evaporate into a din of guitars, with only Mick's vocals to remind us of what we were listening to. It was only during Darryl's bass solo that the band pulled out of the musical crash dive to bring it home. It happened again during "Happy," and one last time during "Satisfaction." Granted, the accoustics were nowhere near as good as the Barclays Center. Prudential has a flat corrugated metal roof, as opposed to the Barclays smooth round roof. It makes a big difference, but I still believe the sound mix was off. "Get Off My Cloud" sounded muddy compared to "The Last Time," which sounded clear and crisp. As noted above, Keith's volume seemed to hit 11 from "Sympathy" through the encores. 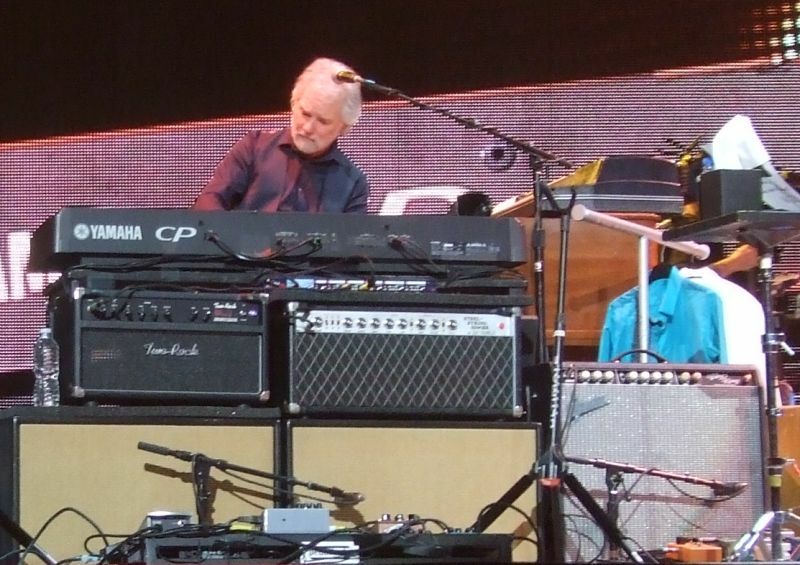 And even Chuck's piano solo during "Honky Tonk Women" felt like he might lose it at any minute. But in the end it was the intensity and the attack that pulled it all through. This was a band determined to entertain. Nobody was going to accuse them of phoning it in, and they didn't. Not for one second. What a show, i was amazed. It was a quick trip from Montreal Qc to New-York, New Jersey. I'd like to thank two of my sons who helped me put my hands on tickets, the day of the pre-sale, i asked them to grab their laptops, i took the Mac, paid for pizza and at noon, we tried for the tickets, i had no success, but my second got them, i was so thrilled. I had the chance to be at the Jimmy Fallon Late Night taping at 30 Rock before the Stones. I was hoping for a visit from one of the 121212 concert performers. Billy Joel was there. He didn't perform, but shared a nice moment with Jimmy Fallon. Happy to see him in a small studio. Jimmy Fallon nicely introduced The Stones at the 121212 concert at Madison Square Garden and i had the chance to see both the next day. Right after the taping, we rode the subway and Path from MidTown to Newark. It took us quite a long time to enter the Arena, don't know why; people in the crowd were not happy. Finally made it, took a bite and a brew and went to our seats. 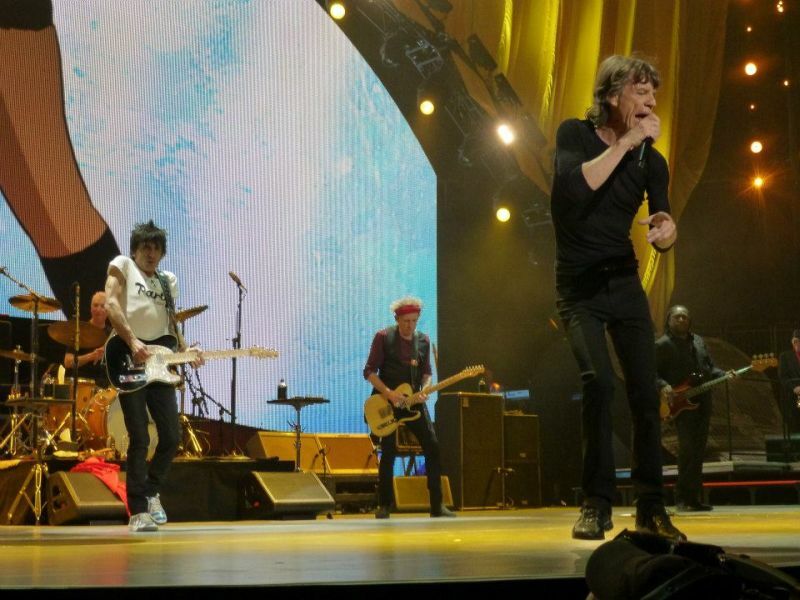 I've seen The Stones quite often , No security tour was my favorite, but it's now second to me. I won't repeat what others, wrote in other reviews before me, but agree with all of them. I voted for around and around and got satisfaction, was surprised it was the most popular with the voters. All the songs were performed to perfection, the only one that slightly dissapointed me was Doom and Gloom. I have to admit one thing here, Sympathy has never been a song i appreciated live, but last night, they nailed it. It was grrrreat. Loved those guitars last night, especially with Rambler of course. To my taste, it was the best setlist of this tour so far. Hope it's not the Last time i see The Stones. A lot has been said already in the reviews so I will just add up a few points. Indeed, that was a great gig. Top level. If Brooklyn sounded like a rehearsal to me (including a catastrophic Gimme Shelter with a guest whose name is better to be forgotten), they have corrected everything they needed to adjust for the first Newark show. Lisa gave an outstanding, really chilling, performance on Gimme Shelter, Midnight Rambler with MT was outstanding and I want to give a special mention to Mick on Sympathy. I don�t know what happened but he was better than ever with his lyrics, focused, deep, so much energy. Bravo Mick. The last show is going to be too good to be true, I�m so upset that I can�t be there�. Have fun all! I was only 48hrs in NYC area, but the target was done, to be present in 50th Anniversary concert in the year they comply 50 years . 1962 � 2012. I landed in Manhattan at mid-day and immediately run to Madison Square Garden to try to get one ticket for 12.12.12. Sandy Relief Concert, unfortunately I can�t afford an original ticket� one guy outside MSG sold me a fake ticket and went back disappointed to my hotel to view the show on tv. I�ve been purchase a lot of tickets with scalpers in Mexico and never had this bitter pill. Next day I went to Paley Center to 50 Years exhibit, nice because you can see a lot of photos from �50� Book but in a large and great resolution, also a good official store in it. Then travel from New York Penn station to Newark Penn station, less than 10 minutes, I think Prudential Center was a good venue for the shows, my dream was to see them play in Madison Square Garden but Prudential center is a beautiful Arena indeed. I didn�t watch any video or listen no audio from previous 3 shows, I expected all were surprise and really was cool! Almost 20 girls with Grrregory mask and dressed all in black starts the show before a couple of fan interviews with opinions about the stones. In my seat (114 row 3) I can see when the boys were in the back preparing for the start. Good choices Get Off Of My Cloud and Last Time for the start of the show, a lot of early photos in the screen with Brian and Bill Wyman carry to you to the early years. 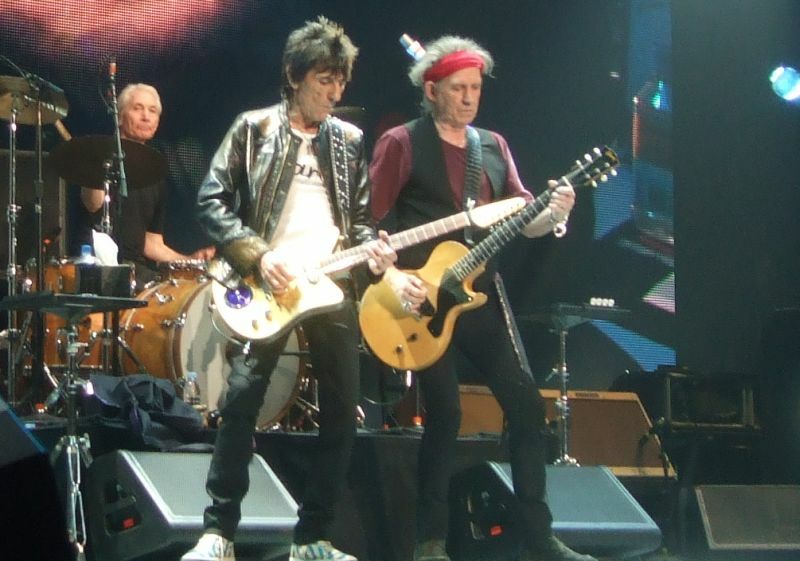 When they started Its Only Rock�n Roll I knew they change all the setlist in comparison with London shows, Gimme Shelter with Lisa is like I want to hear it, for me is Gimme Shelter as in seventies without no women voice or with Lisa only since 1994. 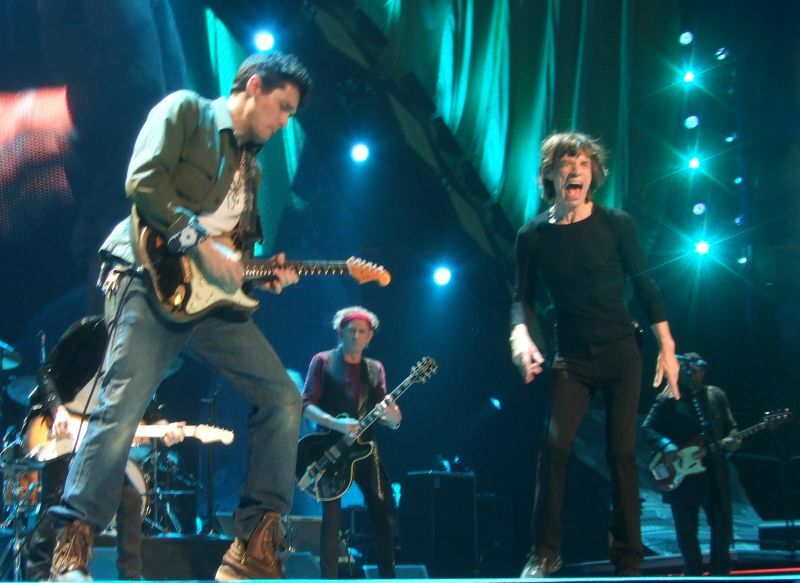 In the morning I saw in official rolling stones app in my cellphone that the confirmed guest for this night will be John Mayer, I didn�t know who he are, only a bluesplayer, but well when they introduce him and Mick says �we don�t play blues, this one called Respectable� wow! What a pretty good version with a great Mayer-Wood-Richards-Mayer solo, but in definitive the price of the ticket will be worth whit the surprise of the night: Around And Around! They didn�t play since el Mocambo 77 and sounds really great, so fresh and well it executed. 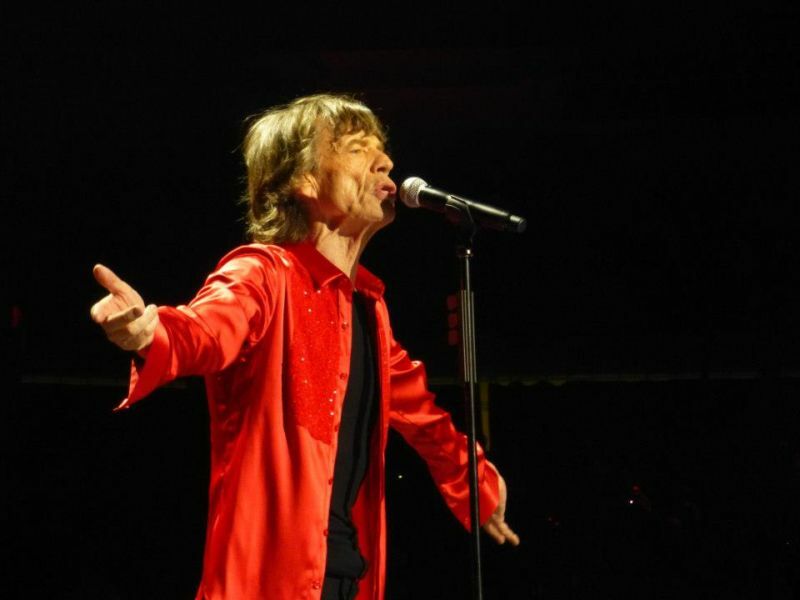 Doom And Gloom sound fine live, Mick delete some words of the lyrics to enduring but in One More Shot he miss almost half of lyrics and he seems really lost in the stage but his 50 years� experience made a funny version of this. Miss You sounds like 1994-95 version with Bobby interpretation at sax and Ronnie walking along the stage and greeting the crowd. Before They Make Me Run and Happy were perfect for a reconciliation with Keith, last part of ABB tour he seems to be tired and the little activity in the last 5 years make me doubt about his play, but he let me know that he is the man and with the Stones he is The Stones Soul! In 2011 my son was born and I named Keith and I will never regret of do that! Time for the warhorses, song that they dominate, this means the show is near to end, and the dream too. Nice decision to hire a choir for You Can�t Always Get What You Want good for close the show before Jumping Jack and Satisfaction. 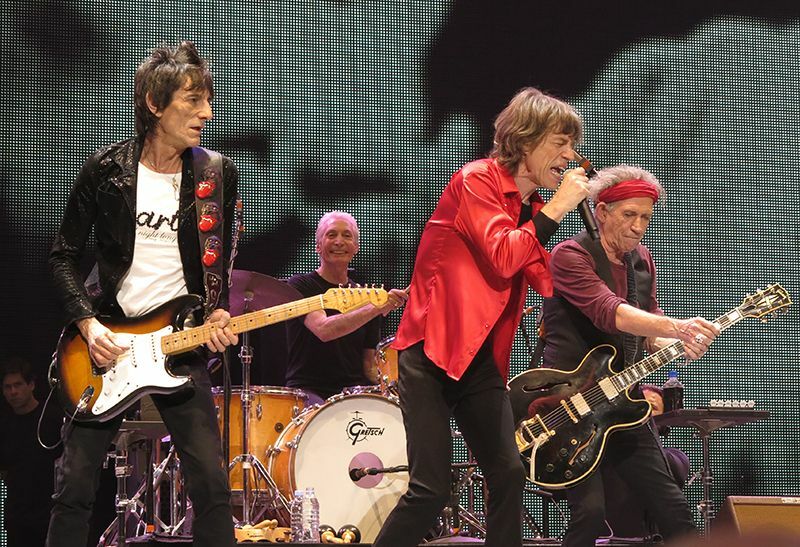 Mick says that the audience whom buy the records, attend the shows are the reason to be for 50 years on the road, I reply Mick, The Rolling Stones are the reason to LIVE! 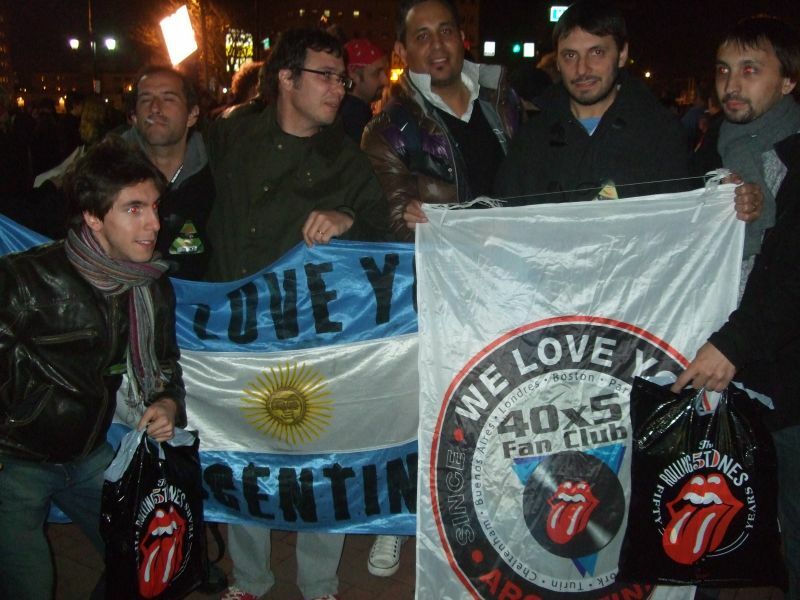 Thanks Rolling Stones. This five 2012 shows are perfect to finish the career but they only knows what will be happen.